As many of my fellow higher-education media professionals do, I often wear many hats. At any given time, I may be the video director, the manager of our digital signage network or the on-campus accessibility expert. And at a few special moments, I may be all of those at once. It was during Towson University's 150th anniversary marketing campaign that I first heard the mantra, "Work smarter, not harder." I was wearing my video director hat at the time. And the words came from my colleague, Christine, who was producing our TV spots. She had joined us from the broadcast news world, where tight deadlines and high stress were the norm. Over time, I was wise to incorporate many of her time-saving techniques. But, of course, I have always thought that I was a smart worker. So in reality, "work smarter, not harder" wasn't really a foreign concept. In fact, I may have attempted to trademark the phrase, "I'm not trying to reinvent the wheel!" But the idea of really living it, and having a multipurpose plan for video content during pre-production, was something that I must admit I was not doing consistently. 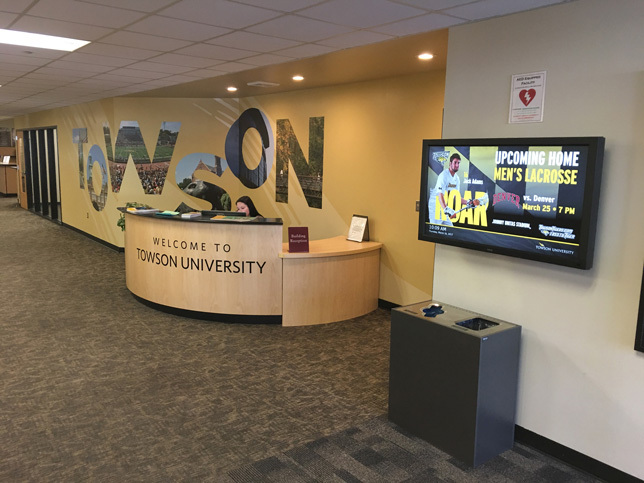 For Towson's 150th anniversary, our goal was to help elevate awareness of the university at a local, state and, at times, national level. We set out to record interviews with our top alumni from across the region. While we were lucky enough to speak with some of our alumni locally, or even back on campus, we found it was necessary to travel for a few of our key interviews. In the spring of 2015, four of us took an early train from Baltimore to New York. Brian Stelter '07, perhaps one of our most famous alumni, had climbed his way from being a media reporter at The New York Times to hosting his own show on CNN, and was gracious enough to give us an hour of his time at the network's New York headquarters. As we arrived, we were ecstatic to learn that we were granted permission to conduct the interview on the live CNN set (even if we only had 15 minutes to do it). The interview was amazing. Brian gave us great talking points, and we were even able to get a few B-roll shots of Brian working in the newsroom. On our trip back to Baltimore, my crew and I were congratulating ourselves for accomplishing our goals and getting this awesome content. But my colleague Christine was already planning out how many ways we were going to deploy it. "We need to work smarter, not harder," she said. Ron Santana will co-present "Stop Creating Content: Leveraging Existing Communication Avenues for Your Digital Signage Network," at Digital Signage Expo 2018 on Thursday, March 29 at 9 a.m. at the Las Vegas Convention Center. For more information, go to www.dse2018.com. Within three months, we recorded more than 15 alumni interviews. We produced two separate TV campaigns, with three alumni in each campaign. In addition to these spots, we also cut a video that was used at our commencement ceremonies that year. This video, which again showed Christine's foresight, was a montage of answers to the question, "What advice do you have for graduates?" She knew that we would never use those answers in our current project, but obviously she was planning ahead. We even went a step further and recut a second montage for our Office of Admissions. This edit included more general answers about the university that would be valuable to prospective students. And finally, even after the 150th anniversary celebration had ended, we used this great content yet again. We removed the expired graphics, created a new look and then were able to use the video as an institutional spot for our broadcast athletic games. Christine's career has since moved on. But I have continued to invoke the mantra, "Work smarter, not harder." While wearing my digital signage hat, I have incorporated the practice into our athletics branding. One example: Every year, our team of graphic designers and photographers spend countless hours creating impeccable poster-style calendars for every athletic team. They always look amazing! However, as soon as each poster was printed, it felt like the content was dead. The photos and design files were archived away on a server in the basement of our data center. It was certainly a shame that so much time was being spent creating something that was never going to be used again. But one day, while I was brainstorming with the project manager, I devised a way for us to repurpose the content. I could use the project file from the poster and separate the layers. Then I could resize the content to match our digital signage display. Once I had the correct size and formatting, I could put on my motion graphic designer hat and animate the layers. By working smarter, I easily had fresh, dynamic signage content for every game. By the following year, back with my video director hat on, we started producing video headshots for all of our athletic teams. These were shot on a green screen and included simple movements, like looking up to the camera and catching a ball. While it took some time to get through all of the players, the post-production was easy, as I used the same background and font selections from the posters and digital signage graphics. We even used the same graphic treatment for our outdoor LED road signs. This also demonstrates something that many schools, including ours, sometimes miss. And that is the idea of branding: promotion of a product through similar and distinctive design. With a school our size, and I imagine with other large schools, there are, at times, multiple departments working to create content. If this content does not have a consistent look and feel, familiarity and awareness will be diminished and the institution as a whole may appear disjointed. Through my experiences, I've learned to really live the concept of working smarter and not harder. So now, at every video interview, I take time to ask not only the questions that I need to satisfy my current project, but also questions that I could potential use one, or even two projects down the road (and, asking alumni for advice to graduates is always a good idea). On our creative services request sheet, we now have a digital signage format option along with a road sign option. Our designers now know to save the files with the layers separated so that my video team can easily animate the graphics. In hindsight, these production techniques really seem like no-brainers. But they literally took years for us to identify and implement. While we had some growing pains during this process, we now work more efficiently with more robust results. These changes have made the department more productive, and frankly, more creative. The mantra, "work smarter, not harder," sounds easy and obvious, but putting it into practice is hard work. As higher education media professionals working with limited budgets, we must strive to improve our workflow and production techniques. This not only improves the quality of our respective institutions, but also improves the quality of our personal workmanship. At times, you may feel you're the only one who wants to effect change. But we owe it to ourselves, and we have the responsibility, to make our product better in every way possible.